In Essaouira, the former Mogador of the Portuguese era, the climate is unusual, ie very mild or cool most of the year. In fact, the cold current that flows along the Atlantic coast of Morocco lowers the summer temperatures, so much so that highs remain about 23 °C (73 °F) even in July and August. The wind is another feature of this climate, since it blows all year long, especially in the form of afternoon breeze in summer. 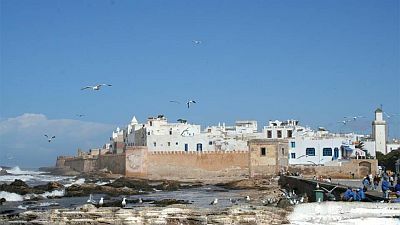 In addition, the climate of Essaouira is characterized by fog and mist, which affect this coastal area especially in the summer mornings, and then dissolve in the afternoon. Typically, the city, which is about a three hour drive from Marrakesh, is visited for its history, for its characteristic alleys, for watching the sea or for surfing and kite surfing, while it is not particularly recommended for swimming and sunbathing. Precipitation is scarce, typical of a semi-desert climate, about 300 millimeters (12 inches) per year, and most of it occurs from October to April. Generally, it occurs in the form of short showers, sometimes even strong. Winter, from December to March, is very mild, with highs ranging about 18/19 °C (64/66 °F). At night the temperature rarely drops below 8 °C (46.5 °F), but on the other hand, wind and humidity increase the feeling of cold. Every now and then, there may be some period of bad weather, with rain and wind; for the rest, the weather is fine. In spring, in April and May, temperatures are very mild, quite similar to those of winter, though the cold at night becomes even more rare, as well as the rains. In the morning, there are frequent mists and fogs. Sometimes the wind can blow from the desert, and in these cases the temperature can exceed 30 °C (86 °F). Summer, from June to September, is particularly cool, wet and windy. In the morning, there are frequent fogs and mists. 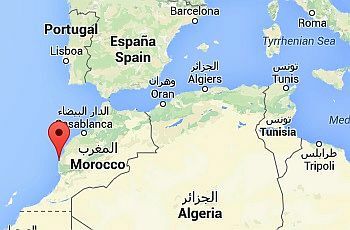 Heat waves from the desert, rare in June, may occur in July and August, with peaks above 40 °C (104 °F), but they are rarer than in other coastal areas of Morocco. However, over the past few years, hot air masses from the desert have prevailed over long periods, distorting somewhat the area's climate. Autumn is pleasant in October, and very mild in November, when it can occasionally get cold at night. Usually, the rains begin to fall in October. The amount of sunshine in Essaouira is good all year round, since fine weather prevails, although the sun is often veiled in a layer of mist or fog, so it is not particularly strong. The sea is very cool even in summer, since the water temperature reaches 21 °C (70 °F) from July to October, in addition, the cool and windy weather conditions are not inviting for swimming, except when the wind blows from the desert. The best time to visit Essaouira, in search of the remains of its Portuguese or Moorish past, or of the stay of Jimi Hendrix and Bob Marley, is from May to October. Given the risk of the albeit rare heatwaves, you can avoid July and August. Even in summer it is useful to bring a sweatshirt; for those who come from Marrakesh and inland areas, the temperature swing can be considerable and can exacerbate the feeling of cold.